This article has been several weeks in the making. I contacted several restaurants and chains with locations in the Loop (and River North, hereafter referred to simply as “the Loop”), and all of them gave me an opportunity to try their products for free in exchange for an honest review of their salads and their establishments as a whole. After finalizing details, I went in and did my testing. Finally, it’s time to give you an unbiased opinion on where you should be getting salads in the Loop. Protein Bar is a favorite of many of my fit friends. With 11 Chicago locations (with exponential growth planned for the next few years), it’s not hard to find one close to work. I love that Protein Bar was the brain child of a man who wanted to do better by himself health-wise… you know you’re in good hands when that’s the genesis story of the restaurant you’re visiting. Taste:What I like about Protein Bar is it’s “flavor profiles” that can be executed in many different forms. I’m talking about taking the same taste you’d find in an asian salad (what I got, pictured below), to a wrap, to a quinoa bowl. The salad composition is what sets Protein Bar apart from anything else on this list. Each bite contains a taste of every ingredient. It’s a perfectly chopped and blended salad. Make sure to ask for your dressing on the side – these salads are big enough for more than one meal depending on your appetite. Nutrition: Depending on what you’ve set your macros to (they don’t call it Protein Bar for nothing), there are multiple tasty ways to hit them. They have an extremely customizable nutrition calculator to support those goals. 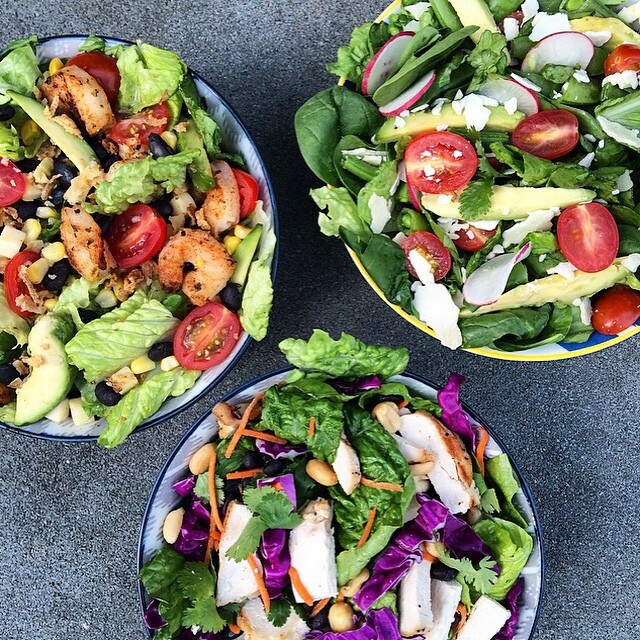 Salads will typically set you back around 500 calories. Price: On the affordability scale, Protein Bar isn’t the cheapest place to get a salad in the Loop, but it’s certainly one of the highest quality salads you can get from a fast casual concept. If you’re planning on being a regular, you’d better download their loyalty app, which gives you $8 after every $88 spent (and a free smoothie on your birthday). They tend to send offers via email as well. Freshii is the type of chain that has cracked the code to creating an association between their brand and healthy living. 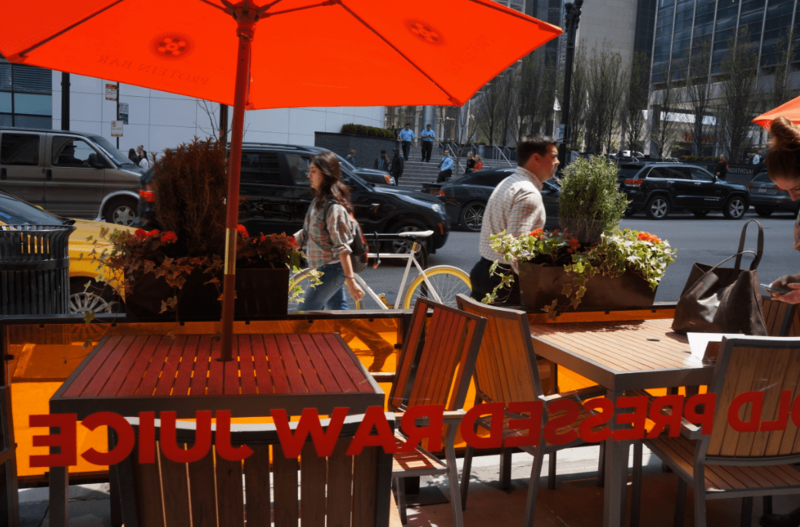 I walked into the River North location pleasantly overtaken by a refreshing feeling. It’s hard to put into words, but I know you’ll feel the same when you check it out. Taste/Nutrition: There’s a soft spot in my heart for any salad that compliments a good cilantro-lime dressing. I got the Fiesta Salad and loved every bite. 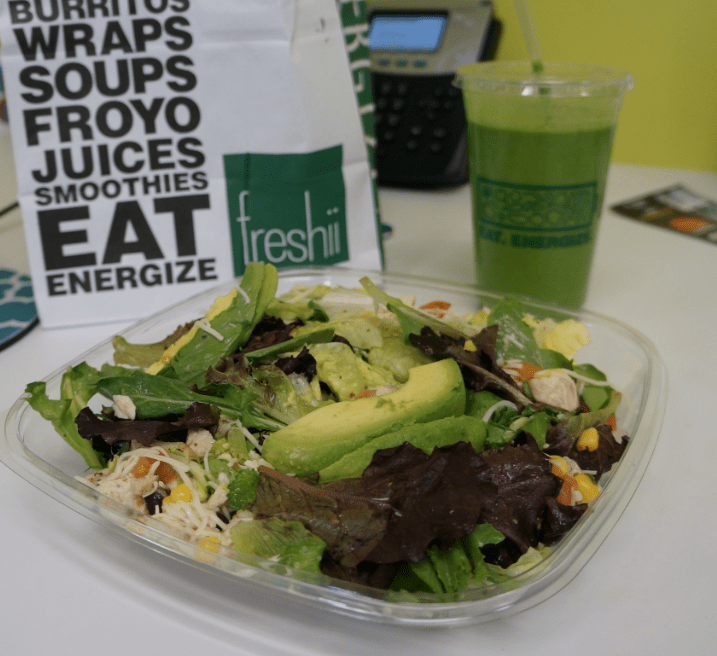 While Just Salad and Protein Bar have mastered the art of the chopped salad, Freshii has mastered the art of a fresh taste in every bite. I also tried their Kefir, which is kind of like frozen yogurt, but more nutritious. Finally, I sampled one of their green juices. It was an incredibly healthy lunch and I loved every bite! Their nutrition information isn’t quite as user-friendly as others on this list, but does exist online. Affordability: Think along the same lines as Protein Bar. Courtesy of Just Salad team. Just Salad is a recent Chicago addition, after finding success initially in New York. They opened with a bang, offering $1 salads and wraps on their first day. I scoped out the line and it was around the block. I decided to wait to try Just Salad in a more manageable setting. Taste: As with many other salad providers on this list, you can opt to create your own salad creation, but should definitely give their mixes a try. These guys are salad artists. Like Protein Bar, they chop up the salad very well and you can taste all of the flavors in one bite. I got the buffalo chicken salad and several jealous stares from coworkers. Nutrition: Salads clock in at about 350 calories (including protein) and go up from there based on the dressing. I got a simple lemon dressing that only added 5 calories and still tasted amazing. The salads are well balanced in terms of protein to veggie ratio. Use their comprehensive and interactive nutrition calculator to drill down the specifics. Affordability: Just Salad isn’t cheap, but they have a great special worth mentioning. Buy a reusable bowl for $1, and every time you bring it back, you get free two “Essential” toppings (veggies, fruit, grains, etc) or one free cheese topping. If you’re a regular, this will definitely add up! I think it’s an interesting take on a loyalty program that takes the environment into consideration. They also have an app to offer additional savings for loyal customers. Taste: Of all the featured salads, the least amount of love went into my Cosi salad. As Cosi isn’t primarily about salads, I guess I can’t be too sour about it. And they were extremely busy even when I went in after the lunch rush. The adobo lime chicken salad didn’t have anything wrong with it, it just wasn’t as special as some of the others listed. Nutrition: Salads ring in around 400 calories or more, but come with a side of bread. Probably not the best place to go for a healthy balanced meal. I want to go back and try one of their sandwiches or bowls and review them again. But for this scope of this article, I’ll let my review stand. 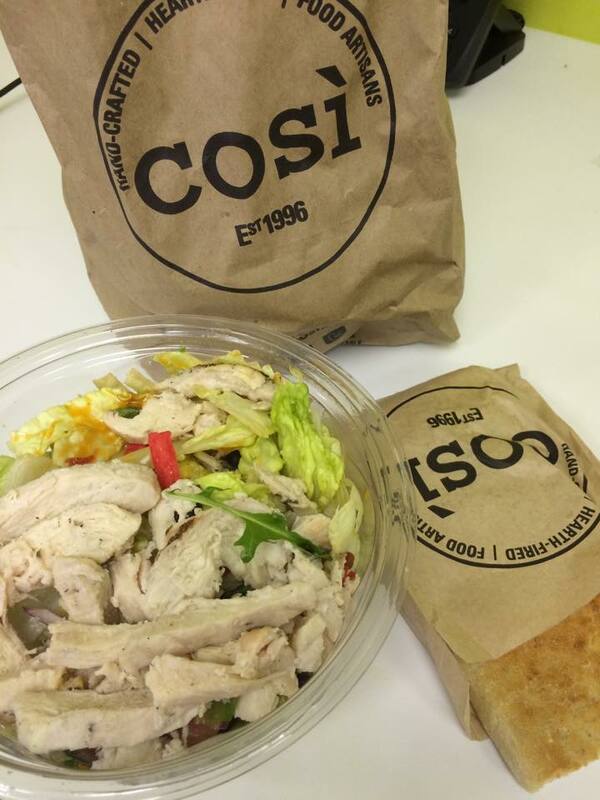 Affordability: Cosi offers a loyalty program that offers you a free meal after your 10th visit. Otherwise it’s similar pricing to any aforementioned salad restaurant on this list. I will admit to a slight bias when it comes to Farmer’s Fridge, but only because I used to work for them. That’s right, their earliest social media marketing came with help from yours truly. But as you can probably guess by now, I don’t promote any brands I can’t get behind. Farmer’s Fridge is an awesome and unique concept – it’s a salad vending machine. This is where I usually lose people. Yes. The salads are refrigerated. And replaced on a daily basis. The leftovers are donated to food pantries. Taste: Farmer’s Fridge salads are arranged in layers to keep as fresh as possible throughout the day. Once you shake in the dressing and distribute the different parts, prepare yourself for a flavor blast. All the ingredients are fresh and organic, so you can enjoy your salad guilt-free (is a salad every guilty, though?). The Cheater has one of my favorite flavor profiles, but look out for their monthly special salads to keep it interesting! Nutrition: Starting this week, each salad has updated nutritional labels! 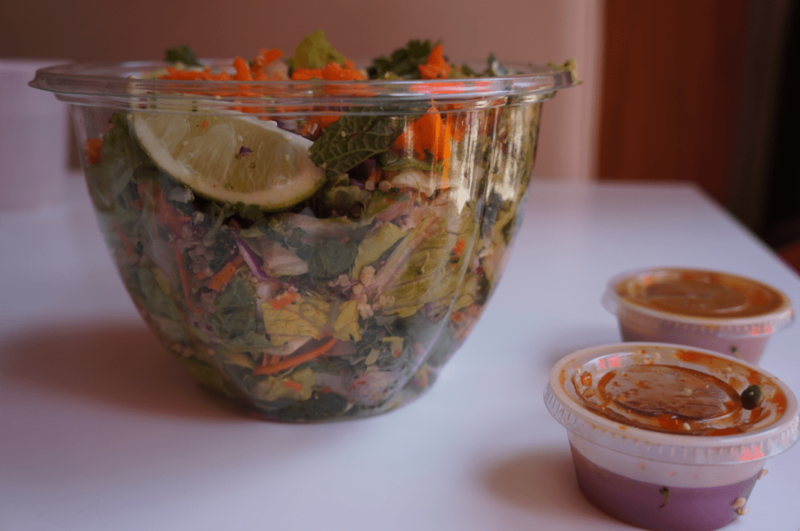 A good feature is that most salads separate dressing nutrition facts from the rest of the nutritional information, so you can weigh using theirs (you should, it’s delicious) versus your own if you’re on a super low-calorie diet. Plus, as previously mentioned, only high-quality ingredients go into each jar. Affordability: A regular salad will cost $6-8, a protein add-on is another $2. After 6pm, all salads are $1 off, and Farmer’s Fridge tends to offer promotions over their social media channels and through their email newsletter. You can return the mason jar it comes in to the kiosk, or upcycle it. I use mine to hold jewelry, tea bags, trail mix, and granola bars. The above represents just a sampling of the places to get salads in the Loop. I think the major takeaway is that you should try a few and pick your favorite to rack up some loyalty points. Or stay in touch with the brands that tend to offer special promotions over their own channels! Finally, Farmer’s Fridge has generously offered a free salad as a giveaway! Enter below if you’re a Chicago resident (can’t get them anywhere else… for now), and I’ll announce the winner by June 15! Farmers Fridge is my fave of the list. I usually don’t use dressing on my salads & when I do it’s very little, except when it’s FF… then I use all the dressing. I haven’t tried Just Salads, so I’ll have to give them a try & buy a reusable bowl. Another great place I love is Fresha on Wells. Their food are very “fresh” like their name suggest. Also, they do tons of freebies via their instagram. I’m actually following on them on Instagram, but neglected to add them since I haven’t personally taste-tested them. Maybe a follow up article will be necessary!